I’ve heard a bit of talk comparing this disc to other discs. I will do the opposite of this for a brief moment, and tell you why it’s NOT like the following discs: the Teebird, the Wraith, and the Valkyrie. It is much faster than the Teebird. The rim is smaller than the Wraith. It is more stable than a Valkyrie. There we have it. Mystery solved, right? It’s probably a good move to call it a “control” driver, because it’s beefier than a fairway driver (Leopard, Teebird, Stalker) but not nearly as beefy as a true distance driver (Wraith, Surge, Nuke). I’ve actually never described a disc as a “control driver,” but I’m not sure I’m going to start either. This is why the Saint hasn’t earned a spot in my bag yet. I keep sticking it in there for casual rounds, but I have to force myself to throw it. I’m not disappointed in the performance, but I just see it as an in-between disc that my brain can’t think of on the golf course. If I see a wide open 350+ foot hole, I grab my beat Star Wraith. If I see a fairway in the woods that I need a specific shape on, I grab my Echo Star Leopard. For all the drives between those two- I use my Champ Teebird. So where does the Saint come marching in for everyone else? 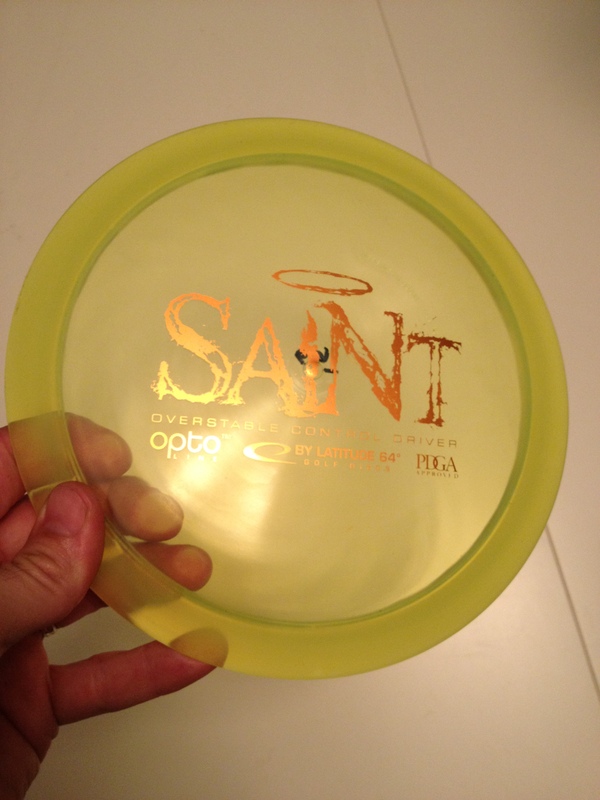 If your bag is exclusively Lat 64, then I imagine the Saint fills an important gap somewhere above the River- giving you more flight and glide than a Striker. I also will fully admit this disc has a few good things going for it. The fact that it’s made by Lat 64 means the plastic is top quality. Also, this disc has a great rim size that feels natural in the hand (but it’s NOT a slanted rim, it’s perpendicular). I would imagine this would lead to more accurate drives, but I don’t have enough time with it to really state this with first-hand knowledge. This is where I’ve left it though- giving props to Lat64 for their great company, but not actually throwing the Saint. When I first read that it was a control driver and that it was slightly over-stable, I thought of a brand new, max weight Champ Teebird. When you get a Teebird out of the box, it has that hint of over-stability that is great in the wind, but it soon breaks in to a regular Teebird. In my head I took it a step further and was already thinking about an “easier to throw Banshee,” since the Banshee is a fairway driver with over-stability and a smaller rim. The Saint is nothing like a Banshee. It has way more glide and speed but less stability. I think the lack of information, combined with my incorrect guesses, have given me a false start on the Saint. I’ll keep plugging away with it, but in the meantime it hasn’t quite filled any important roles in my bag. What do you think of it? …really? …wow. …you don’t say!!! This entry was posted in Equipment and Gear and tagged 64, disc, golf, lat, latitude, review, saint. Bookmark the permalink.